Infinite Art Tournament: The Reading List: "Cry, the Beloved Country"
There’s a fine little epigram titled "On Some South African Novelists" that I’ve always remembered from the anthology of poetry we used in my college lit class. Now that’s plenty clever. Never having really heard of any South African novelists, it was always hard to imagine which particular South African novelists were under discussion and whether it was a fair assessment, but I still enjoyed this snappy snark at the literary scene down at the Cape. As I got into Cry, the Beloved Country, which is so far as I know the first South African novel I’ve read, I started to wonder if Alan Paton might be one of “them,” one of “some South African novelists.” Turns out, no. Roy Campbell, the fellow who wrote the zinger, was a South African himself, and presumably knew of quite a few South African writers and wasn’t just taking a potshot at the one big famous one. Also, he wrote his barb in 1930, and Cry, the Beloved Country wasn’t published until 1948, which is a bit of a giveaway. Mind you, Cry, the Beloved Country is certainly a novel written with firm restraint. Its language is spare and simple, often using repetition for emphasis and effect. The characters speak Zulu, but the book is written in English, and Paton uses literal translation of idiom for… for… well, restraint. The stripped down vocabulary gives his characters considerable dignity. They do not tell each other to have a great day! – they say “go well and be well.” They do not make long speeches about the great tragedies that have been imposed on them; they say “this is a very heavy thing that has happened.” By keeping the language simple, Paton creates great emotional depth, like an artist with an inkpen can create a vast landscape with a relatively few simple lines. So, he uses the snaffle and the curb all right. The horse, meanwhile, is a robust plot involving a linked set of family tragedies set against the deeply troubled society of South Africa in the 1940s. There is no missing-horse issue in Cry, the Beloved Country. What makes Paton’s work remarkable – and no doubt about it, this is an exceptional work of fiction – is that he manages to take plot material that could easily overcook into maudlin melodrama, or descend into crushing pessimism, and infuse it with an ample helping of joy, humor, and grace. How does he do it? Well, the firm restraint with which he writes helps, but there’s also a keenly observed humanity in all of his characters. They are a set of decent people trying to do well according to the rules of the society they were born into. In this world, it is never easy to do well according to the rules of the society you are born into. You know it, I know it, and Alan Paton knew it. They come out of the Court, the white on one side, the black on the other, according to custom. But the young white man breaks the custom, and he and Msimangu help the old and broken man, one on each side of him. It is not often that such a custom is broken. It is only when there is a deep experience that such a custom is broken. The young man’s brow is set, and he looks fiercely before him. That is partly because it is a deep experience, and partly because of the custom that is being broken. For such a thing is not lightly done. Paton’s characters are not Sunday-school constructs – everyone in the book has their flaws and their weaknesses on display – but on balance, they are people of goodwill, and this makes this a sad and challenging novel, yet ultimately a hopeful one. It culminates in a final few pages that unites the extremes of human hope and despair in a remarkable episode so understated that a careless reader might not even notice it was happening. Well, that’s firm restraint for you. 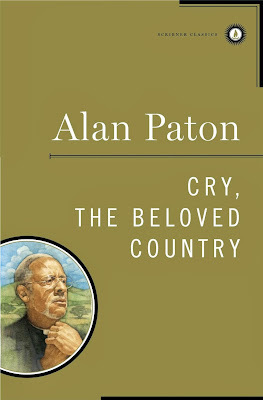 Cry, the Beloved Country, was strongly recommended by Mrs.5000 for this reading list. She did not, however, recommend it as light vacation reading. She was abundantly correct on both counts. I made this recommendation to someone else that was compiling a reading list... One of my favorites from high school. Wait...surely you've read "The Life and Times of Michael K"? Libby, I've never even heard of "The Life and Times of Michael K." At first I thought you were making some sort of play on the former name of this here blog, "The Life and Times of Michael5K," but according to the internet here there's a South African novel by that name. Should I read it? On vacation? Is it written with firm restraint? I read this in high school too and remember being impatient to reach the end, but only so I wouldn't have to keep reading it. I think I was rather against firm restraint at the time. Hmmm all these years I assumed the former name of this blog was a play on the name of the South African novel. Just goes to show what happens when one assumes! I mean, you could read it or not. But not on vacation. My memory is a little vague on the level of firm restraint.